From those dark and dismal days when our forefathers were trying to weld together a nation of disconnected states, we now turn to another epic of our nation’s history when these selfsame states were in mortal combat to tear apart all the work done in the years past ‑ The War Between the States or The Civil War. 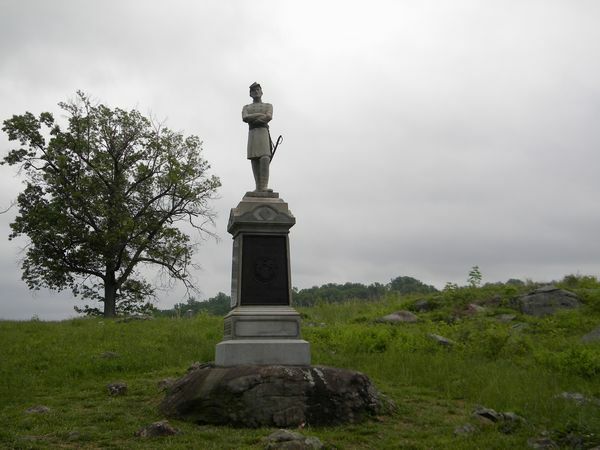 Of all the regiments participating none had a more brilliant or bloody record than our own 124th New York Volunteer Infantry of which Company H was recruited here in our village. The 124th, which was soon to be known as “Orange Blossoms” was composed of men from different sections of Orange, County. Company H. which was recruited by Captain David Crist, Lieutenant Henry Gowdy, and Lieutenant John R. Hays, was composed of the flower of our Village manpower. When you think that our Village of less than six hundred and fifty turned out a company of eighty two upon President Lincoln’s call for “three hundred thousand more” is it any wonder that there were many a vacant chair in our homes that never would be filled again. On that day late in August of 1862 eighty two of Walden’s finest marched away forGoshen where on September 5. 1862 they were mustered into the service of the United States and served until mustered out near Washington on June 3, 1865. It is not the idea to write a history of the 124th. For those who are interested we would suggest reading Colonel Charles H. Weygant’s History of the 124th N.Y. VOL. Inf.” A condensed record of this Walden company of three commissioned officers, three musicians, one wagoner and seventy five rifles shows, of casualties wounded, fifty two; of casualties killed ten; died in captivity, four; died of wounds, four; discharges for disability from disease incurred in line of duty, eighteen; mustered out on expiration of service, twenty five; and of this twenty five who served the full term of enlistment five had been wounded once, two twice, two three times, and three Sergeants had been wounded twice and after their second wounding had served terms of imprisonment until exchanged. Out of this company of eighty two men only thirteen passed through the enlistment unscathed. Of the four Congressional Medals of Honor awarded to men of the 124th two were wonby Walden men the first by Archibald Freeman aged twenty and the other to Thomas W. Bradley who later became our representative in Congress. Manassas Gap, Fredericksburg, Chancellorsville Beverley Ford, Gettysburgh, Wapping Heights, Auburn, Kellvts Pord, Locust Grove, Mine Run, Wilderness, Po River, Spottsylvania, Fredricksburg, Road, Ny River, Chesterfield Bridge, North Anna Totopotomy, Cold Harbor, Assault of Petersburg, Strawberry Plains, Petersburgh Mine Explosion, Deep Bottom, Poplar Spring Church, Siege of Petersburg, Boydton Road, Weldon Raid, Watkins House, Hatchers Run, Second Boyton Road Fall of Petersburg, Farmvilie, Deatonsville Road, Sailors Creek: Appotomattox Surrender, Walden has been represented in this titanic struggle before the formation of Company H.
Many young men, hearing of the firing on Fort Sumter fifteen months before, joined up, some with Col. Van Wyck’s Tenth Legion from Ulster County, some with Captain Ellis at Bull Run‑, some with the Third New York and Captain Decker’s Nineteenth Militia (mostly from the Village of Montgomery.” Men from this section were with Sickles Brigade on the Peninsular, with Ellsworth’s Avengers, and, not to be outdone, Henry Mathews, served in the navy. Scores of others from our township were serving in various commands. 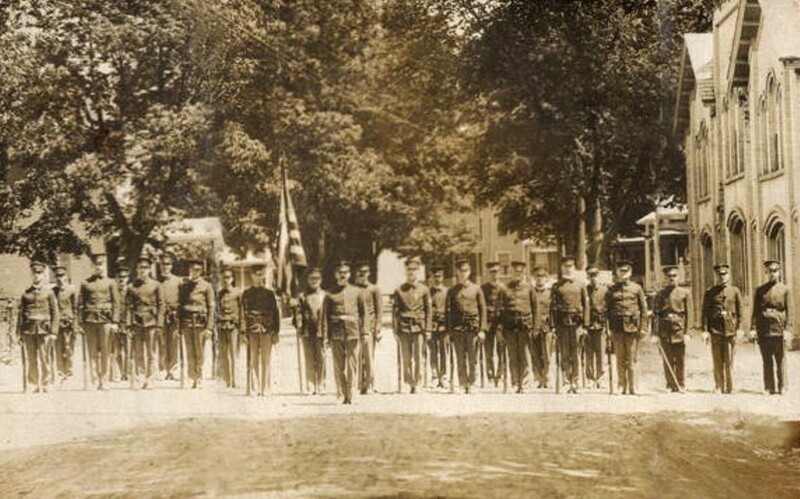 Walden had no organized unit in the Spanish‑American War but a number of Walden men “joined up.” Most joined at Middletown in the National Guard Company, and, as true sons of Walden, served with distinction throughout this short but decisive war. And pray remember, dear reader, that no matter how short the War or “action” or what it might be wounds hurt just as much and their dead are just as dead as those who served in larger wars. Lieutenant Henry Gowdey, in leg, was in Washington with his brother, did not see him. ” Albert R Rhinehart, severely. ” William H Cox, slightly. Corporal Benjamin Dutcher, in thigh, flesh wound. ” John R Post, slight—on duty. William H Brown, above eye—not severe. Thomas H Baker, in both legs. John McCann, in arm, badly. Daniel Carman, in leg, slight. Charles Seaman, Mortally wounded, left on the field—so reported.